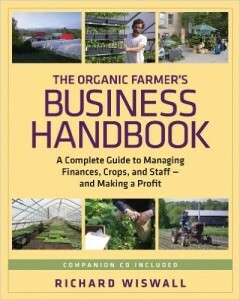 Eventually he would write the Organic Farmer’s Business Handbook: A Complete Guide to Managing Finances, Crops, and Staff – and Making a Profit. This book comes with a companion CD that included templets for creating worksheets, budgets including cash flow projections, and even payroll. He’s manager of the Cate Farm a family owned and operated organic farm in Central Vermont that includes 22 acres and seven 100-foot long greenhouses of organic vegetables, medicinal herbs, and flowers. Everything they sell is certified organic. So I’ve been farming full time for about 35 years now. 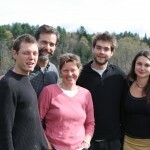 Business has changed over the years, for the first 20 years, I was a highly diversified organic vegetable, herb and flower produce that sold to markets in Central Vermont and through Deep Root Organic Coop, which is a growers coop that sells to Boston and NY to bigger stores. We had a CSA in the nineties, went to Farmer’s market for 25 years. As I get older I don’t want to work as long and hard as I used to so we no longer do the CSA or Market, even though I’m big fans of both of them. The other thing I’ve been doing besides farming is to help other farmers trying to help tune up their businesses, because I’ve seen a lot of people after 9-10 years they’re struggle after making long hours, their burning out because the money is not there. I was helping others at conferences etc so I wrote the book because I saw things that came up over and over again that seem to be point needing to be addressed. In short farmers love doing what they do for all the right reasons, being outside and watching plants grow, and nurturing them and producing delicious nutritious food, what could be better there’s a fundamental satisfaction from that. I don’t think anybody gets into farming because they want to be a business person, and study business sheets and cash flow projections but ultimately the reality is farming is a business and you have to know the business end of it where you’re not gonna succeed. You can be as ecologically sustainable but if you aren’t economically sustainable that goes out the window because you wont be in business anymore. I think a lot of farmers tend to over work themselves. Farmers can be guilty of self exploitation because they believe so strongly in what they do and it’s a great life but they can work longer and longer hours and sacrifice other parts of your life to make your farm succeed but that self-exploitation has a boundary as some point where you can’t do that as much anymore and you can’t keep going or you burn out. That’s where I’m coming from, that’s where I like to point people, if you are going to try to make a living farming or market gardening, pay attention to the business end. I heard a guy say in a Facebook group the other day that you can’t make money farming unless you have big average and its a struggle. And certainly all of my podcasting friends talk about how if your podcast isn’t making money it’s a hobby and not a business you need to think about, know how much you want to follow your passions you have to be realist, and as an artist it’s the same lesson I need to learn there too. No matter how much you like to do what you like to do it there’s always that piece how are you gonna make money at it..
It’s interesting you bring up people say that’ it’s hard to do, I don’t want to sugar coat it, it’s true there’s a lot of barriers involved, farming is a hard way to make a living, but there’s that kind of nay-sayer attitude that is self-fulfilling and I’m not sure if it’s a genetic defect of farmers that tend to moan more then look on the bright side. I think what you hear in the farming community more people are complaining about things that can go wrong, whether its markets, pests, or disease or the tractor breakdown. You hear very little from the people who are successful and there’s a reason because people who are successful, don’t like to brag about their success. So you don’t hear from them. Also if you say I can’t make a living farming, its an easy course to teach, well you just taught yourself, the more you think that then you can say you achieved your goal. As opposed to I believe very strongly a good living can be made farming, you just have to think about it treat it more as a business then as something that will fall into your lap. One thing has been a bit of a theme this year on the show, with things challenging even if one thing fails, the majority of things work. One thing might not work and you’ll learn something. Every year there’s gonna be something that fails but the majority of things grow. My parents kept a garden all through my childhood and my first gardening experience was me and my brother was maybe 2 years older then me, I don’t think we were hired just we were asked to flip a new piece of ground. So we took some spades, hoeing it into shape, and it’s a very fond memories of the satisfaction in working in the earth. After that my parents had a garden we helped tend the garden. My first solo garden was 19 working at a summer plot, there was a community garden, that’s the steep learning curve, you have to try putting peppers, what kind of peppers are you gonna grow, spacing, and cut worms what are you gonna do about cut worms? There’s all those things, that was a very positive thing. Plus the fact that all the neighbors and fellow employees were so willing to help share their knowledge about how to do things. I think that’s a positive part of the gardening community people are willing to help one another out working for everyone’s success, that’s a very positive thing. It wasn’t till I came to Cate farm and tilled up an acre, we had someone custom till an acre we had a very diverse shotgun approach of what would do well, and what would sell well. The next year 2 acres- doubling to 4 acres and then … 6 acres, 8 acres… 12 acres. up to 16 acres, and so very quickly we went up to scale, then actually back down to about 12, because 12 highly diverse row crops was about all that I wanted to handle with the crew that I had. As a kid I always grew up wanting to be a homesteader, me and my brother would go read Mother Earth News from issue one and totally into the self-sufficiency and independent living skills. I thought as a kid well I would be half-time farmer half-time professional but I became a full time farmer pretty quick. Luckily happily so. You grew up in Vermont right? No, I grew up on Long Island (NY) on south shore which was very agricultural I grew up with potato and cabbage farms surrounding me, even though my family weren’t farmers but I was surrounded by it. Since then it’s changed to more houses and woods. Long Island was a great place to grow up in the 50s and 60s. Then I moved to VT in college and have been here ever since. I grew up on Long Island too and people are always surprised, Long Island has lots of nature preserves and cool farms on the Eastern end. Once you get past the commuting line, half way out on the Eastern end it has lots of agriculture and almost has a New England feel and look to it. I think I was attracted to organic farming, besides reading all the Mother Earth News way back when. I went to school, during junior year went to Nepal, outside Katmandu valley, living in a mud hut and they raised water buffalo and we biked to school for language and culture classes and that was a pivotal part of life. I did an independent project on effects of green revolution. That started me thinking along the lines of wanting to run my own farm. Helena Scott Nearing came to talk. Wendall Berry Unsettling of America kind of capped it all, but it was when my college advisor put me on a tractor one weekend to help him disc a field, when I realized what I wanted to be doing. That’s kind of how it started. Organic Gardening is kind of living by a set of values, for me, being an organic farmer I like having a business compromising my values for having a healthy planet and producing nutritious food. To use natures cycles to produce a nutritious food without any undo impact or harmful impact. So for me it’s using as much that’s given to us, whether is’t sunlight, atmospheric nitrogen, carbon, very incredibly diverse microbial complex soil and inter-relationships that we can use to grow good food for people, plants and animals. Organic gardening on a technical level we’re certified organic, so there’s a federal law that says what’s organic and what’s not. But on a general level it’s using those natural cycles and treating the soil with the most upmost respect so you are encouraging it, nutrient cycling as much s possible and treating the soil with respect. On a practical level we use a lot of cover crops. We have the ability because we have more acreage then we row crop that we can rotate things in and out of cover crops. We actually got a combine to grow grains as part of our rotations. If you grow cover crops, you are basically growing a crop that is resting the soil from row crops, as well as increasing it’s biological activity and increasing its organic matter by just plowing the crop back into the ground. We also use a lot of compost and rock minerals. We do a lot of soil tests to quite a bit to see, if you need rock phosphate, or green sand or lime to put on soils to achieve the balance your looking for. Do you want to tell listeners what a cover crop is? grow a few inches and it will winter kill in the norths, quickly till that into the soil and build your soil that way so it protects your soil, it increases your soil biological activity, it adds carbon all good things. This year we had a challenging spring weather-wise. We have a lot of cover crops in the ground. We are growing more greenhouse crops. The greenhouse crops are insulated from bad weather. 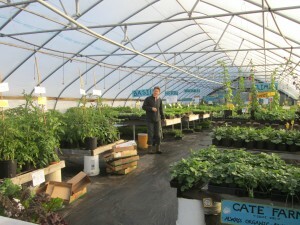 We have 7 greenhouses that we grow some seedlings for sale for others, 6 packs of tomatoes and broccoli for example. Then we have a couple of greenhouses where we have tomatoes in the ground…grafting. We have other greenhouses where we grow greens lettuce and beets and other things in the ground that we harvest for sale. In terms of how did the season grow, outside it was ok, we had a partial crop loss due to weather, but that’s ok because you roll with the punches. In the greenhouse everything was find because can control heat, we are able to roll up sides so we can lower when it’s cold and we have drip irrigation so we can add it when we need it. The top is like a big umbrella even when it’s open so those are big factors when growing a crop, is to provide the right growing conditions. Do you keep the greenhouses growing during the winter? No, in VT, you can, but our markets are much more spring and summer and fall oriented. In the winter time, at least where we are at 44º north latitude, you don’t have enough photoperiod the days are too short from Mid Nov- Dec till the first week in Feb, so basically you can’t grow without lights, without supplemental lighting. But what you can do is you can start some spinach in Sept and let it get up to almost full size as it get’s colder even without the heat on it will be like having a refrigerator full of spinach., then on a sunny day when it warms up you can cut it, and sell it and it will freeze solid no big deal then come spring it will actually start growing. Around feb 15th window it will start regrowing, will sprout up again, get another crop off by the end of march we do that with spinach but generally we like to freeze greenhouses, we drain water but we let it get really cold to help control pests and disease. When I first asked do they keep their greenhouses growing all winter. If you are having a problem growing tomatoes, because of early blight or leaf diseases that a simple unheated greenhouse makes your job so much easier, because you can prevent rain from falling on the leaves, if you can keep the leaf surface dry then you have eliminated 95% of the problem because they can’t colonize bacteria and fungi on it. You just roll up sides to lower for extra warmth. 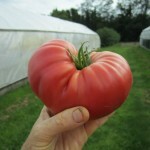 You can produce fantastic tomatoes that taste great and that look perfect. We simply trellis them. We drop strings down from the greenhouse structure. so they are about 8 foot tall looks like a hedge row these five rows that are 8-10’ tall loaded with tomatoes. It’s not hard to do with some kind of greenhouse structure, and even on a small scale proven winner. Almost every professional grower I know relies on greenhouse tomatoes and not field tomatoes. They do grow some field tomatoes but it’s so much better to grow in greenhouses. Listeners maybe think greenhouses tomatoes don’t taste that good, but they get a bad rap from commercial growers, but they actually taste better, because you are providing every thing it likes. By providing warmer nights, even irrigation through a drip hose, you get higher fertility and better management everything a tomato wants, you can grow any variety in a greenhouse, but you can grow incredibly good tasting ones, that will be producing right up through a hard freeze outside. Do you have raised beds in the greenhouse or they are in the ground in the green house? What are they growing in? When I talk about a greenhouse basically these are metal hoop kind of gable pitched roof, metal pipe frames with a covering of plastic one or two layers of plastic, of special greenhouse poly that lasts a couple of years, so we basically you can take regular garden soil and put a greenhouse over it, by put posts in the ground and covering it with plastic. We add compost and rock powders, and till the beds up, we will make small raised bed, not dramatically, then lay drip lines, and then put mulch on top of drip lines, and then plant tomatoes on top of the it, then through the mulch. and they grow up like Jack in the Bean Stalk. You are putting starts or seeds? We will start tomatoes in a flat and grow them up to be about 8 inches tall and then bring them into the greenhouse for rest of life till they set red fruit till we pull them out later in November. So when do you start the seeds and then when do you transplant to greenhouse? A tomato plant from the time you take a seed to the time you want to transplant it into the ground typically takes 6 weeks. when do you plant? 6-8 weeks. From there you put in the ground, we start seeds inside in February under lights, then we transplant in late March/April 1st here to a greenhouse, then from April first then it will probably be another 60 days before we start getting red fruit. It takes about 60 days for an open yellow tomato flower to set red fruit, depending on variety, just to give you a sense of that 2 months, basically red fruit in the greenhouse end of June/July 1st somewhere. 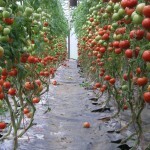 Then what we will do is we will keep growing the tomatoes in the ground, because it takes 60 days to flower to red fruit. Around September first we top all the plants, basically, without getting too complicated in the biology of a tomato plant. If you top the plant and stop the growth of any new fruit then you are channeling all of the energy into existing fruit then you will havemore productive fruit, before you end up pulling plants when it’s too cold around November 1st growing tomatoes without extra heat. That’s why on Sept 1st we top them so no new flowers emerge and channel it into the existing fruti. By Sept we’re getting frost. We do too but if you have that green house you have that layer of plastic and the ability to roll down the sides. Go to the website pictures of the greenhouse all the sidewalls go up so you get the cross breeze but at night we roll them down so at night we can retain the heat so even if it’s 27-26º outside it will not freeze inside the greenhouse without any supplemental heat and if you need to you could take bar-b-cue turn it on at night and that would keep it from freezing. It still seems fast for growing tomatoes? 60 days to red so do you plant them in succession? If you’re getting tomatoes in June you must put some later to keep them growing all summer? So basically there’s a bell curve of production on tomatoes and most plants be it beans or peas, in the middle of production get tons of fruit, then they slow down again as they siness. We do 3 plantings, do an early planting wait 2 weeks, and do another transplanting, and wait 2 weeks, not all coming up at once and evens out that bell curve effect. A tomato will grow if you were gonna heat it will grow all year long. If you were to keep growing that plant all year long, by just keep pruning off the leaves, and let that growing tip have a place to grow, you can let it grow straight up, you can grow it sideways, you can let it grow 90 feet and 10 feet up, that’s done to maximize for production. I just got clarify a couple of more things. Do you do three plantings every 3 weeks. Let’s say your gonna plant 10 varieties. Do you plant 10 every 2 weeks? We call them waves 1st wave will be all 10 varieties. Then the second wave will be the same, a mirror image of that so you are always getting each variety over the course of the season. The other thing we do graft our tomatoes and I encourage people to play around with this it’s pretty exciting people have been grafting apple trees. People have been grafting plants in Asia since early 1900s because of space and people. We grow side by side, one tray of a root stock and one tray of the top good tasting tomatoes we want. We grow them side by side until they are 3-4 inches tall the stem is the diameter of a toothpick or a thick match stick, then you make a bias cut in each of them and you kind of fuse stems together and then once they fuse you cut top off of the root stock and keep the top of the good taking tomatoes. Because the rootstock is a vigorous grower, not only do you get an earlier fruit but twice the production of the tomato if you didn’t graft it. We grow this one variety of buffalo that you can’t but we bought five years worth of seed and put it in our freezer. WE grow Buffalo on the this maxofort. They start out the same, all of a sudden it’s like the horse went crazy, the one plant will be 3 feet tall, and the other will be 8 feet tall. We graft all of our tomatoes now. People graft all sorts of things. You can google it. You can graft cucumbers and winter squash and all sorts of fun stuff. The thing is you have to buy 2 seeds to get one plant but because that plant produces 2xs as much so you end up using 1/2 as many in the end so it’s kind of a wash. 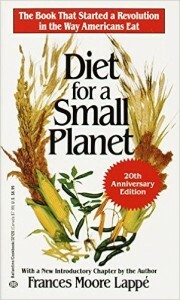 So my guest number 100 was Bill McDorman who talks about saving seeds and he said you get so many seeds from a tomato. That’s true if you’re growing open pollinated tomatoes, I’m sure that’s what he’s talking about which is true to type. The one variety we like is actually a hybrid, so we have to start with a seed not from our own source but from the company that protects it’s parentage. I guess we do save a lot of our seed on a few things that are easier to do. Tomatoes you don’t have to isolate so much certain things you have to isolate and worry about cross pollination from insects or wind, so we don’t try to save all of our seeds. I think it’s great to try to do that and you can do some of your own breeding too. Can you explain what roots stock is? Rootstock is just a heartier type of tomato. Its a tomato if if you were gonna grow it out wouldn’t taste good but the plant grows like a weed. There’s all sorts of maxifort, esimo, beaufort. If you were to going to Johnny’s Selected Seed. They have these tutorials online and you can see how to graft and they explain it, visual of what is happening. But you can use the rootstock is a type of tomato that is very vigorous growing and then you graft on top of that the variety that you might want to grow that might not be as vigorous of a grower. My wife does the seedlings that we sell to the general public and she’s always trying things I’ve never even heard of so its always fun, we’ll be selling things that I have never grown that is kind of fun. Partly because Ive been doing it for 35 year so we’re kind of at cruising altitude, tweeting things as we go but not making huge monumental changes except for the varieties my wife is doing in the greenhouse, we’ll probably keep the same basic farm plan we’ve been doing the last few years. Do you want to tell us if maybe you were starting out or success tips for starting out with a Farmer’s Market or CSA? There’s lots of tips I would give, I don’t know if I can do it in 5 minutes? If you can develop a handshake relationship with a buyer whether it’s a chef or a produce manager, check in with them during the winter and then check in with them in the spring, and then check in again 2 weeks before you have the product to sell, it’s important to maintain a positive relationship with it should be self-sustaining. Once you bring in that first case of vegetables and the price is agreeable it’s a pivotal point then say great that’s your first sale hopefully as long as you don’t do anything wrong they’ll buy from you week and year after year. And review at the end and negotiation and what worked. being as efficient as possible and this much per pound. analyzing am I making money on this or not? $15-20 hour use that number, if I wasn’t farming if I could be a waiter or if I could be a landscaper, that’s kind of a substitute wage you can kind of get a sense of what that might be. Whether it’s on Facebook or shopping or whatever it might be. You might see, do you sell a lot of greens to restaurants? Am I remember ing that right. Were selling less variety and more of fewer things. let’s talk about price, I need to make this, you need to sell for this how can we make this work? Once you have that relationship it’s a great place to be. I like it all. What I really like about my job, the seasonal aspect of it is I don’t do one thing 365 days a year. So in the spring you’re busy preparing soil, making beds, and getting seeds in the ground you’re doing that all year, but the bulk of it is in the early spring. Until it gets too cold. i wouldn’t want to do one everyday for the rest of my life I enjoy them all in the appropriate season. One of my least favorite things to do is collecting money from people who don’t pay up… conflict resolution with accounts or people who work here… just anytime you have a relationship, you have to work on it. Those are probably the harder times. I guess if it’s 20º and blowing snow and have to go pick kale, that gets’ kind of old too. I mean weather, we’ve slogged around in some miserable times, you have to do it and it can be pretty miserable. Weather is you know, you sign up for that, it’s part of the game. That things want to grow. Plants want to grow and we just have to step out of the way sometimes. It’s a wonder that a seed contains all this genetic info to go from this minuscule seed into a fully developed plant. That will then go through it’s life cycle and set another seed altho usually harvested before that. You have to not screw up. Plants will grow. Have faith in that. Plants are on your side. Probably be a shovel. It’s a tough one. I could probably come up with more, humorous answer to that. Something would be very elemental for working with the soil. Not really cause that’s like saying what’s your favorite dessert there’s just too many of them. I love to see more people making a living farming that are happy with what they are doing and not sacrificing other parts of their life. If we would all state what we want in life, once you do that it’s a lot easier to achieve it. And then if you think what is it what you are wanting to do, articulate and writing it on paper,and think this is what I want. It’s hard to achieve a goal and that’s good advice for anybody and not just farmers. The other thing I recommend for folks to do, if you are not doing a market garden, or farm already just spend 5 minutes to write down your likes and dislikes. What do you like about your farming or job? and what do you not like? For ex, if you don’t like bookkeeping or sales, truth be told I do’t like record keeping but I realize I have to do it to make my business to be well tuned It’s not like I love to record keep, I don’t think anybody does, its just part of the job description. I mean a lot of running a business and thinking about life, I’m a big goal setter, and writing goals down. Lots of guests have answered that in different ways, some say I hate weeding some say I love weeding, so you might be surprised to find someone who likes to do what you don’t like, and with marketing, lots of people think I don’t want twitter or social media but then they would realize it’s lots of fun. Oh Yeah tell people about coaching because I think that’s important. Basically what I do is work through a couple of organizations to tune up their business, to make a business plan, go over what the farms goals are and how to achieve them. lot of times, if they are asked they’re just waiting for an excuse and if you make that request, they spend the hour to do it then I can review it and with the coaching business becomes confident relationship what we have developed that helps them take time away from their workaday. I’m a big fan there’s coaching in all different in all shapes you just have to look around for it in your niche. I finally got an accountability in September, and it’s helped a bunch, we’ve both seen huge leaps and it’s not like we didn’t know but having someone to talk it through. And I’m also taking a class now that’s got an actual teacher and assignments not just go at your own pace. And then John Lee Dumas, the head of my podcasting group has this acronym FOCUS Follow One Course Until Success. Makes you think about that you really want. Seems really simple but sometimes it’s more difficult then you expect. They talk a lot about find someone who’s been there before, a mentor, and for me having someone walk me through the steps has been invaluable. We read each other’s websites and emails and even though we have two completely different businesses we help each other move forward. Soon people will ask you about podcasting. I did just start teaching a podcasting course. I’m hoping to eventually go through my community college so I’m trying a beta group right now. it’s an incredible strong economic engine if we can get a lot of people growing food for themselves, as a small family or as a single person unit, it’s not that glamorous but if you have 10,000 farmers working towards all producing food it’s the backbone of most local communities. Strong agriculture community and prosperous community and that will solve a lot of the other problems that will help today. I hope that happens more I see a lot of interest with young people. Hope that I wish them success! I think it’s such a fun thing to do and gardening is the most popular past time for good reason because it’s fun and satisfying and there’s no end to the learning curve because you can always learn something new and it’s highly creative there’s so many things about gardening. Don’t forget to mention chelsea green! There one of the few emails I read when it comes, I subscribe to their books. That’s how I found you it came in the email and I loved it and bought it. richardwiswall.com more for the consulting workshop end of my life! So you can look at that as well!